To understand the time and care that is invested in each silk screen print job, we thought it would be helpful to show you what happens each time we have a new job to print. 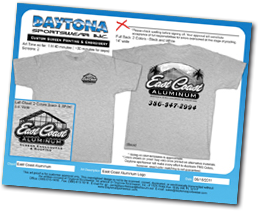 So from concept to creation you have a full grasp of the process here at Daytona Sportswear. This will help you understand some key phrases and terms that can get thrown around and help you understand the time and cost involved in making your masterpiece. The first step to any task is the idea, or initial concept. 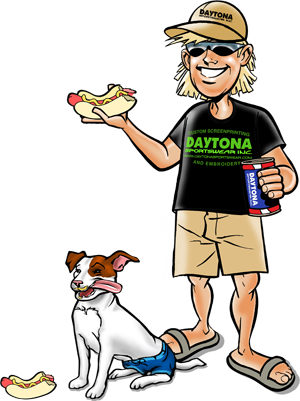 The process here at Daytona Sportswear is no exception. Whether you have the design already, or the art team here is tasked with creating your design, the artistic vision must be made tangible. To make a masterpiece there must obviously be art. Whether it is made by our art team, or submitted to us in the proper format, size, and resolution the next step is making sure we have the art and in the best resolution and format possible. There are many ways to submit us your own art, logos, or content should you need to. #3 Another way is by emailing us or contacting us through the contact form on our website (You can send files or links to files on sites like yousendit.com or dropbox.com if you have them loaded. Once we have the artwork, it gets sent to our art department for processing. 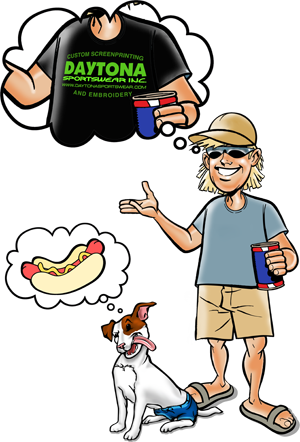 Once the art is in the hands of the Art Department, they take a look at your printing instructions and come up with a composite proof, so you can see what your design will look like on the t-shirts (or koozies, hats, sweatshirts, baby doll tees or other products). Our proofs will show you the ink colors to be used on your order, the print sizes and dimensions for your artwork, and it will confirm the specific print locations you have instructed us to print. At this time, you can instruct the art department to make any changes you see fit. If you'd like different ink colors used in your design, notice a name is spelled wrong, or want to size the art differently, just let us know. Sometimes we are confined to a minimum or maximum print area or size constaints due to palette and/or product sizes, or due to legibility. We don't print your job until you are thrilled with your proof and you have specifically approved it for printing. We'll work with you until you are 100% satisfied with your design! This is where your design is separated out into each color that makes up your design. The more complex the design, or number of colors the design requires, the longer this process can take. Once separated, we then output each of these separate colors onto its own piece of film and use it to make a negative very similar to the process in photography. Once the art is on film, our print crew transfers the film positives onto silk screens as negatives and preps them for printing. Each screen must be burned, blocked, taped, setup, and prepped for squeegee applications. Once each screen has been made and placed in its station, the design must be put in the proper registry, which means lining up the design on the garments so it is being printed where you intended and centered vertically and horizontally. This is done for EACH color or screen, so they precisely overlap each other when printing. Even a hair off and the picture will blur and turn a masterpiece into an eye-sore. Once lined up the proper colors are put in place and the squeegeeing begins. The squeegee passes over the screen and lays ink down in all the area not blocked out by the negative. 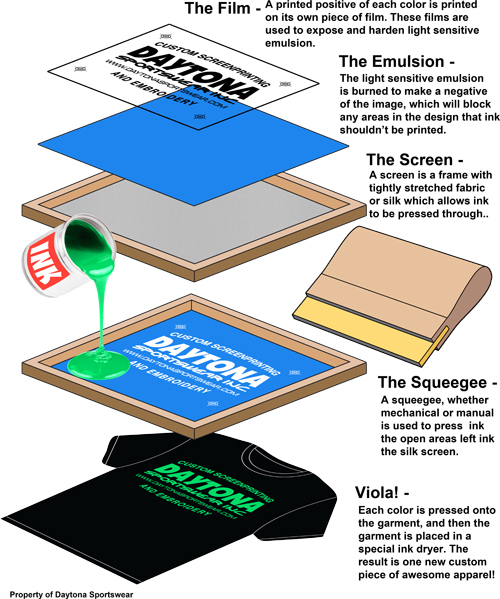 Once each color of a design for that print area have been laid down, the garment is removed from the press and put in a specialized dryer, that quick dries the ink and makes the shirt wearable. 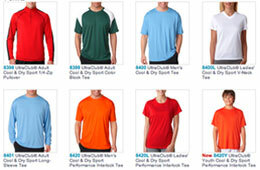 The printing and drying process is repeated for each print location on the shirt or garment. Because you can only print one location at a time, this process can take quite some time. For example once you print a back print, the shirts are taken off, dried and all the print equipment, the ink and the screens are swapped out for the new design and the shirts are rerun through the press and re-dried for the new location. The more locations and the more colors, again, the longer the process. This is why the amount of colors and amount of locations can add to the shirt prices. FLASHING - Sometimes it becomes necessary to dry a color before another one is added. That is where "flashing" comes in. Often this process applies to the underbase (see above), but sometimes is used in between other colors as well. This often results in a brighter, more professional quality printing, and adds to the years of wear and tear. When all is done the result has taken us from a single concept to a gorgeous piece of tangible art. From digital art to film, from film to screens on press, from press to wet ink on the shirts, from wet ink on shirts to the dryer, from the dryer to your hands (once cooled of course)... the result is a fantastic new piece of apparel that you can be proud to wear anywhere, redistribute, sell, give away, or frame as a masterpiece. What once was just a dream or a sliver of ones imagination is now a reality. Just imagine if we had to do this each time a single t-shirt was ordered. You can see why screen printing works best for printing in bulk quantities. For smaller runs, we may recommend alternative methods such as heatpress, sublimation printing, or even embroidery for items in smaller quantity. For larger runs with more colors, we use one of our automated presses.